This voice changer features the helmet, mask, and chest plate that made the very image of Darth Vader an icon. The helmet is adjustable to fit all head sizes from age 5 to adult. Includes 3x "AA" batteries. 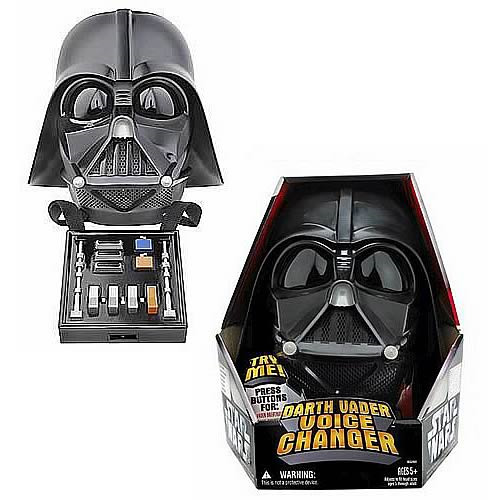 Tips to help you achieve the best performance from your Darth Vader Voice Changer: This toy is packaged in "Try Me" mode, which has deactivated the voice-changer feature. To reactivate this, simply slide the switch to 1 of the 3 settings before playing with the toy. Also, the microphone is adjustable. Bend it closer to the wearer's mouth for optimal voice clarity. For best fit, adjust the straps. If the voices and sounds are slow or unclear, check the batteries to be sure they are fresh and inserted correctly. See instruction sheet for complete details and... enjoy!